There is something profound and emotionally uplifting about watching dolphins swim and play, especially when there are dozens of them around your boat. It’s mesmerizing. Then you get in the water, and the experience becomes surreal and awe-inspiring as they shoot past you — a moment you’ll record in your memory for a lifetime. While everyone else swam with the dolphins, I sat on the boat and tried not to throw up into the water. Swimming with the dolphins is a unique and wonderful experience, especially for someone who has never done anything like that before. Many tour companies in Hawai’i provide excellent excursions out into the ocean and have experienced, skilled, and knowledgeable captains and crews who look after their guests and try to provide them with the best possible experience. But it is important for tourists to understand what is involved in taking one of these tours and to prepare themselves for it. In my case, it was this lack of knowledge about the experience and lack of preparation for it that made me unable to participate fully. Claudia Merrill, one of the experienced and knowledgeable guides at Dolphin Discoveries, recommends that newcomers to dolphin swims be aware that this is not an experience for first-time swimmers. Swimmers should feel comfortable in the ocean, and it is preferable, though not mandatory, to have some experience with snorkelling. It is important to be well rested, too, and that is one of the areas where I was deficient when I went on my dolphin swim. Be sure not to book your swim for the day after you arrive in Hawai’i, which was the mistake that I made. Our flight was delayed, and I went out onto the ocean with only two hours of sleep. I was weak, exhausted, and feeling seasick for the most important part of the tour — the part where we were allowed to go into the water to swim with the dolphins. I was too weak to swim in the ocean and too seasick to put the snorkel tube in my mouth without gagging. It would have been a much better experience if I had booked the swim for the following day and prepared appropriately. One of the things that Merrill specifically warns against is setting expectations too high. She says that, since you are entering the dolphin’s world, you must go with an open mind, and accept the experience that you have. The dolphins may not be in a playful mood at the time that you are there, and people must respect dolphins’ moods and habits. While Dolphin Discoveries has a high success rate with finding dolphins, it is up to the dolphins to choose to interact or not. For those who know they are prone to seasickness, it is best to take something for it one or two hours ahead of the swim, so that it is in your system by the time you are on the water. Once you are out there and feeling ill, it is too late to take something. There are natural remedies available for help with seasickness. Consult your naturopath on what would work best for you. Make sure you take protective measures for preventing sunburns. The UV rays from the sun reflect off the water and you can get a severe burn if you are not protected. Bring hats, cover-ups, and sunscreens that don’t damage coral, as well as bottles of water to keep hydrated. It is possible to take photographs of the dolphins both above and below the water, as long as you have the right type of camera. We were able to grab a disposable camera at our resort’s gift shop that was suitable for taking underwater photos, but if I had done any preparation for this outing, we would have bought a better one for the trip. Merrill cautions people looking for a dolphin swim tour to do their due diligence and make sure that they go with a tour that correctly sets people’s expectations. Be wary of anyone who guarantees that you will see and interact with dolphins. 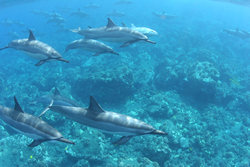 A good charter will be sensitive to the habits of the dolphins and adhere to guidelines set down by the Coral Reef Alliance (CORAL) and the National Oceanic and Atmospheric Administration (NOAA). Most reputable tour operators are members of CORAL. Tour operators should always do their utmost to make the least impact on marine life. If dolphins are not interested in interacting with people on a given day, then your guides should respect their wishes. Experienced guides will know when it is not a good time for a dolphin swim. When dolphins are resting, breeding, or nursing, it is not acceptable to disturb them for play. It is possible that you may also encounter whales on your dolphin tour. On our way back to shore, we saw a mother humpback whale and her baby. Whales winter in Hawai’i and it was a privilege to see this pair. Our captain described how the whales travel from the Arctic to spend the winter in the Hawaiian waters and have their babies. The tour that I went on with Dolphin Discoveries was still one of the highlights of my trip to Hawai’i, and that was because our tour guides knew what they were doing and the dolphins cooperated. We were able to watch dolphins from all vantage points on our boat as they jumped and played in the water. One dolphin approached the boat where I sat and appeared to want to say “hello.” With some forethought, it is possible to take this beautiful dolphin-watching experience into the water and it can be truly a life-changer.